We have a great double bill for you this month: free improvisation and original music from two fantastic UK bands! As usual at The Vortex it’s doors at 7.30pm, with the music starting around 8pm. Advance tickets are £8 from the Vortex website, or it’s £10 on the door. An improvising trio of vibraphone, baritone sax and bass, this group first played together in 2014 and brings together three musicians active on the UK jazz and improvised music scene. Olie Brice leads his own quartet as well as playing in numerous other collaborations including a trio with Toby Delius and Mark Sanders; BABs with Alex Bonney and James Allsopp; Nick Malcolm Quartet; Loz Speyer’s Inner Space Music; and Alex Ward Quintet/Sextet. Cath Roberts leads two groups playing her compositions, Sloth Racket and Quadraceratops, as well as writing and improvising new music with guitarist Anton Hunter as Ripsaw Catfish. She is a member of the Madwort Sax Quartet, Anton Hunter’s Article XI, the eight-piece improvising saxophone group Saxoctopus and the collaborative quartet Word Of Moth. Corey Mwamba leads his own trio, Yana, and is involved in a variety of other groups including Sonsale; duos with Rachel Musson, Orphy Robinson and Robert Mitchell; Martin Archer’s large ensemble Engine Room Favourites; and Nat Birchall’s quintet. He is recognised as a highly creative improviser and composer working across a wide range of jazz and contemporary music, as well as a programmer of forward-looking music in his home city of Derby. 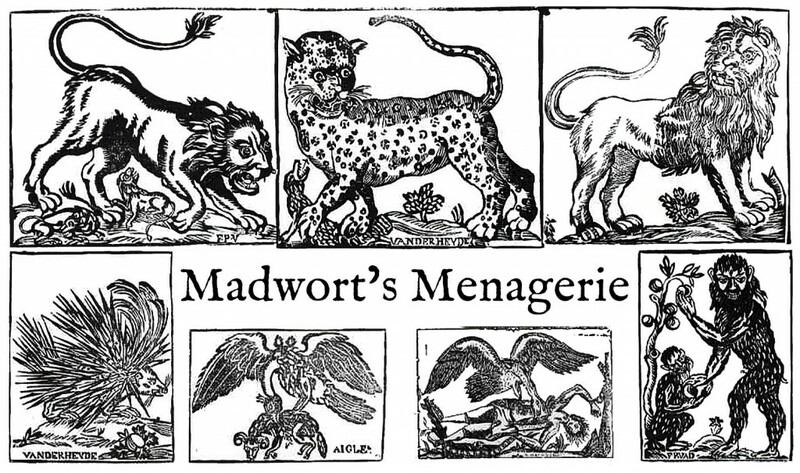 This entry was posted in BARITONE, bass, bass clarinets, clarinets, cornet in the house, drums, grooves, improv, joy, magic, new compositions!, northern friends!, saxes, vibes, Yeah on March 17, 2016 by cath. Our second gig of February is a special one: we are taking LUME to the cosy basement of the London Review Bookshop in Bloomsbury. Part of the bookshop by day, and home to literary events and film screenings, the downstairs room will become our intimate setting for Seth Bennett’s new project En Bas Quartet. En Bas Quartet is, as the name suggests, a low string quartet, featuring some of the most exciting string improvisers in the U.K. They will be playing Seth’s quartet for improvising low strings, based on the Northumberland folk song tune “Sair Fyeld Hinny”, and exploring various settings and provocations for group and solo improvisation. Inspired by the quartets of Shostakovich, Beethoven and Bartok, as well as more contemporary jazz ensembles like Arcado String Trio, the Masada string trio and contemporary British free improvisation, En Bas Quartet weave their disparate influences into a compelling whole. This gig is a ticketed event (unusual for us I know!) and the room at LRB has a limited capacity. The ticket includes a drink, and it’s doors at 7pm with the music starting at 7.30pm. Buy your advance tickets HERE. This entry was posted in bass, bookshop invasion, cello, free bar (sort of! ), improv, joy, northern friends!, strings, violas, Yeah on February 8, 2016 by cath. 17th December @ Hundred Years Gallery: The Hat Speaks! ….plus new additions Seth Bennett and Tori Handsley! Taking inspiration from long-running Manchester night The Noise Upstairs (founded by Anton Hunter and Tullis Rennie no less), we will put all the players’ names into a hat, throw the dice to determine how many musicians will play, and then draw out the names. The result is lots of mini- sets from often completely new combinations of people! Some groups from last time have decided to carry on playing together too: Tom Ward and Adam Fairhall are now collaborating on a new quartet for 2016 after their hat encounter in the Summer! Do join us for this last gig of the year – it’s been a blast, so let’s see it off in style! Entry, as usual, is one Bank of England note of your choice. Doors 7.30pm, first roll of the dice 8pm. Hundred Years Gallery, 13 Pearson Street, London E2 8JD. This entry was posted in anyone fancy a beer, bass, bass clarinets, bleep!, clarinets, cornet in the house, dice-throwing, drums, electronics, fish gets experimental, flutes, guitars, HAT, improv, joy, magic, massive lineup, northern friends!, nuts, overcrowding, pandemonium, party!, randomness, saxes, thanks for a great year everyone, trombones, trumpets, two drummers!, vibes on December 7, 2015 by cath. 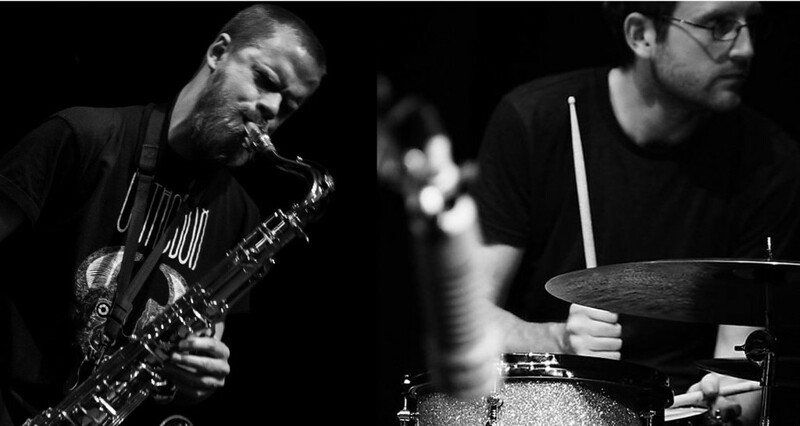 Spontaneous, living music in-the-moment from two of the UK’s finest improvisers. Fiery, free-wheeling sax and drums duo from DIY improv/noise label Raw Tonk Records. 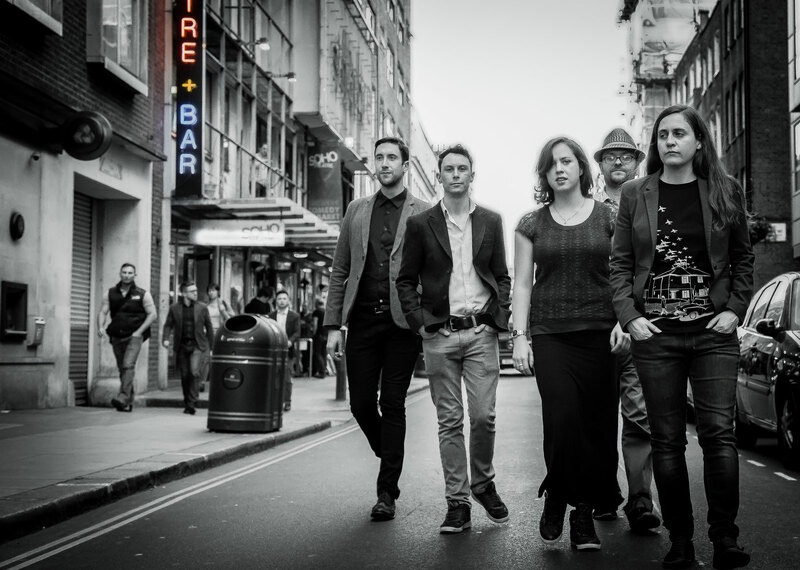 Space jazz quintet led by Dee Byrne, currently making waves with their debut album ‘New Era’. Juggling order and chaos, composition and improvisation, they take listeners on an exploration of the musical cosmos. Brand new group formed for Gateshead Jazz Festival 2015 by Cath Roberts. Improvisers from Manchester, Leeds, Macclesfield and London navigate a set of experimental graphic scores, using them as a jumping-off point for freely improvised group explorations. Intricate compositions and delicate textures from Tom Ward’s chamber jazz sextet, with a diverse collection of instruments played by high-calibre improvisers from across the London creative music scene. This entry was posted in a year seems to have passed, Announcements, Barbican!?? !, bass, bass clarinets, cello, clarinets, cornet in the house, drums, fish gets experimental, flutes, for once no table moving!, grooves, guitars, improv, joy, keyboardfest, LJF, magic, massive lineup, northern friends!, saxes, sloths, space fish, strings, trombones, trumpets, vibes on November 2, 2015 by cath. This week we’re decamping to Hundred Years Gallery once more, for a special gig to celebrate our second birthday! We have assembled a nebulous ensemble of musicians – from the London jazz/improvised music scene and beyond – to take part in a series of improvised performances. Who plays in each set will be determined using our dice and hat method, inspired by the long-running Manchester night The Noise Upstairs. 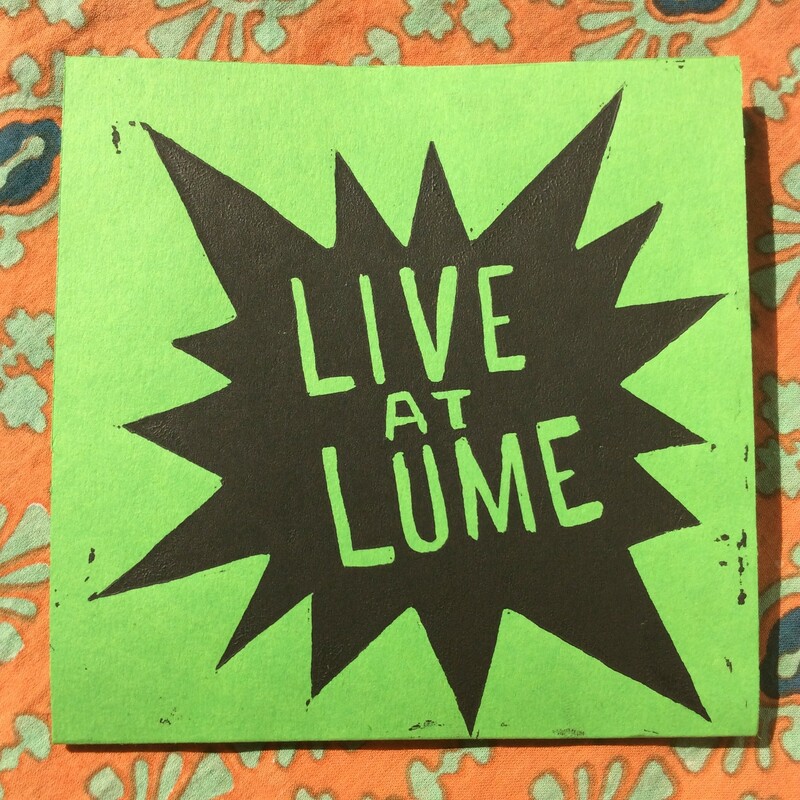 The evening will also function as the launch of our ‘Live At LUME’ fundraiser compilation; an album of live performances recorded at LUME gigs, donated by a bunch of our favourite musicians. This is available as a download, plus we’ve also produced special CD editions with hand-printed sleeves. All proceeds go towards our running costs for the next year of LUME gigs. 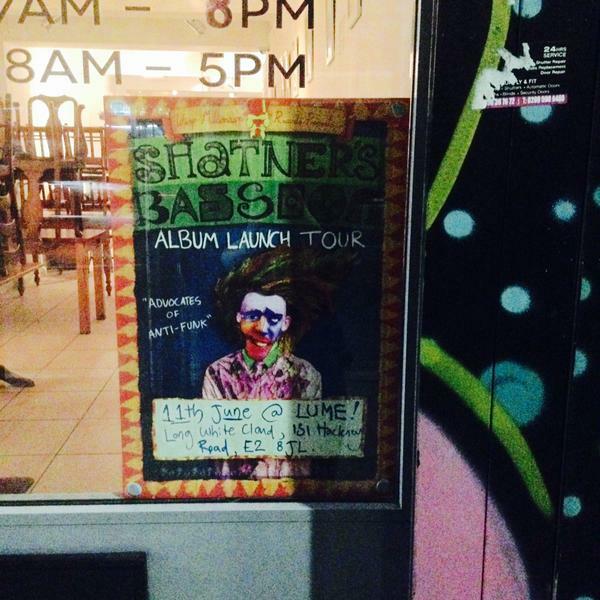 Grab your copy on here or at the gig! Entry is, as usual, one Bank of England note of your choice. Doors 7.30pm, music 8pm. We’d love to see you there as we mark two years of LUME activity. Bring your friends! Hundred Years Gallery is just around the corner from Hoxton station at 13 Pearson Street, E2 8JD. This entry was posted in a year seems to have passed, album launch!, bass, birthdays!, cello, dice-throwing, drums, electronics, fish gets experimental, for once no table moving!, grooves, guitars, HAT, improv, joy, keyboardfest, magic, massive lineup, northern friends!, nuts, overcrowding, pandemonium, party!, randomness, saxes, strings, synths, toy piano!, two drummers!, vibes on July 3, 2015 by cath. They’re back! 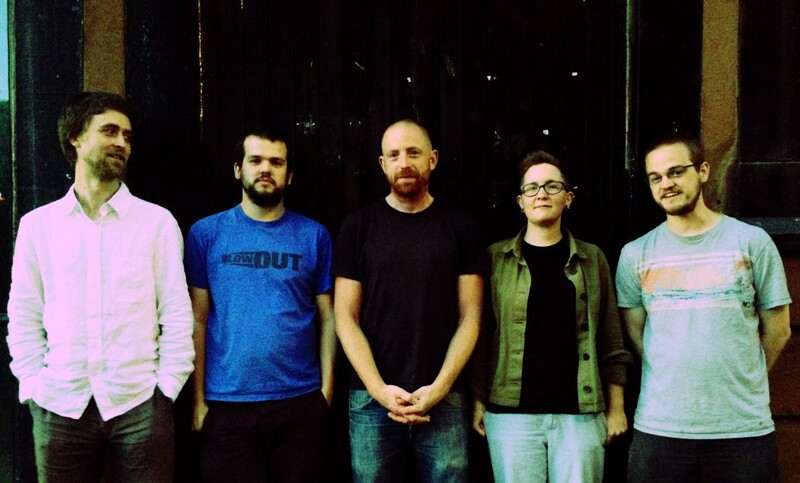 Leeds’ finest iconoclastic sextet return to Long White Cloud on their UK tour. When they told us they were coming through London promoting their new album, we couldn’t resist inviting them back. Come with us on a joyous journey into musical chaos, as the band unleash their violent cocktail of Zornish style collisions and freewheeling improv, negotiating a path from the beautiful to the sinister, humorous and surreal. An essential gig…make sure you get here early! This entry was posted in album launch!, bass, drums, electronics, guitars, improv, joy, keyboardfest, magic, massive lineup, northern friends!, nuts, overcrowding, pandemonium, saxes, table moving, two drummers! on June 5, 2015 by cath. We invited our good friend Colin Webster to take the reins at LUME for a week, so this Thursday will be a Raw Tonk special! Colin’s label puts out all sorts of cool music and is well worth checking out if you haven’t already. For this gig, guitarist David Birchall (who you might have caught playing with Sam Andreae and Andrew Cheetham at ‘LUME Presents…’ earlier this year) will collaborate with Colin. They’ll be playing solo improvised sets, then joining together for a duo. 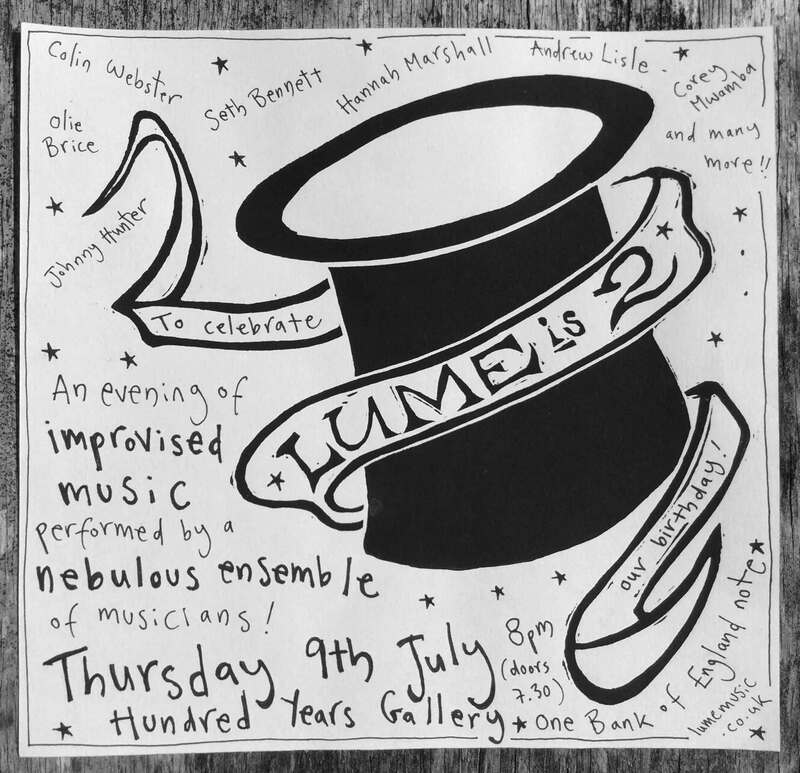 Come down and hear some of the UK’s finest improvisers! 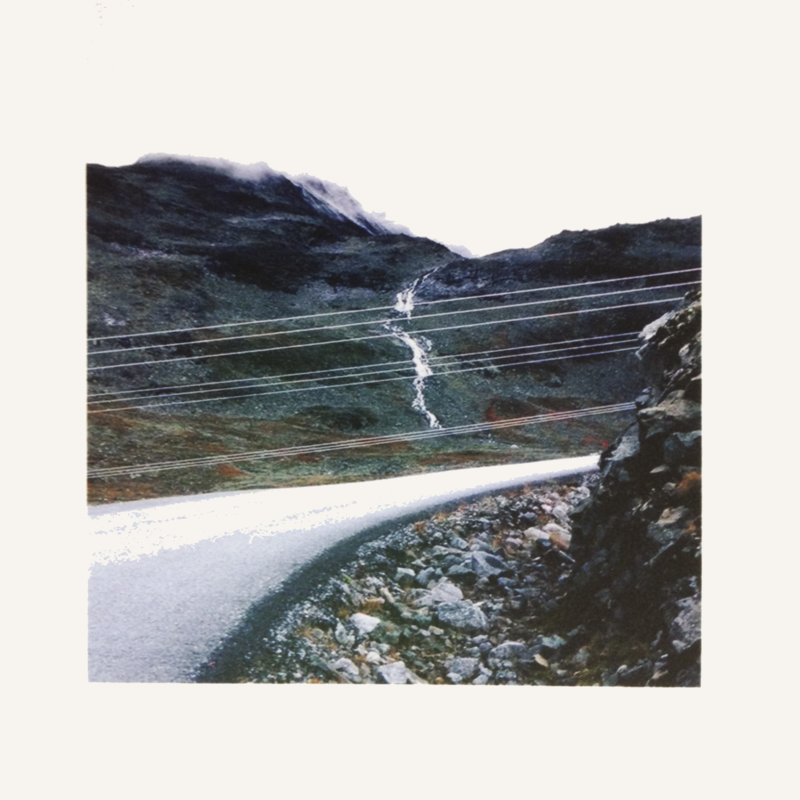 This entry was posted in for once no table moving!, guitars, improv, joy, northern friends!, saxes on May 22, 2015 by cath. Alex Ward is a highly-acclaimed composer, improviser, and performing musician. His involvement in freely improvised music dates back to 1986, when he met the guitarist Derek Bailey. As an improviser, he was initially principally a clarinettist (sometimes also playing alto sax), but since 2000 he has also been active as an improvising guitarist. On both instruments, his longest-standing collaborations in this field have been with the drummer Steve Noble. Much of his writing and performing has been done with Dead Days Beyond Help, a duo with drummer Jem Doulton. He also currently leads a number of bands including Predicate, Forebrace, The Alex Ward Quintet/Sextet, and Alex Ward & The Dead Ends. For this new project, saxophonist/composer Cath Roberts assembles four of the most exciting improvisers on the UK scene. Tenor player Sam Andreae is known for his collaborations with Scandinavian musicians in the exceptional and critically-acclaimed Trio Riot and Silence Blossoms, as well as countless other projects including a recent sound art installation at Manchester’s Penthouse with David Birchall. Anton Hunter was recently commissioned by Manchester Jazz Festival to write a new suite of music ‘Article 11’, in addition to leading his own trio, playing in Beats And Pieces Big Band and co-running experimental/jazz/improv label Efpi Records. 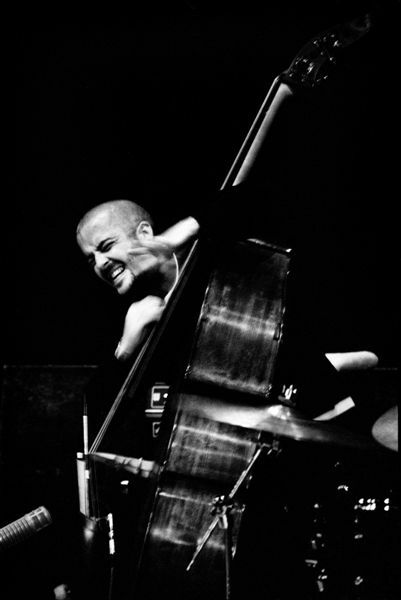 Seth Bennett is a prolific bassist, leading his own trio Nut Club as well as playing in Martin Archer’s Engine Room Favourites, Laura Cole’s Metamorphic, and the Grew Quartet among many others. Johnny Hunter has recently toured the UK with his quartet and appears regularly in all kinds of settings, from Nat Birchall’s spiritual jazz group to dub reggae band Skamel. The group will play a new set of music by Cath, using it as a jumping-off point for freely improvised group explorations. This entry was posted in bass, clarinets, drums, guitars, improv, joy, northern friends!, saxes, sloths on April 10, 2015 by cath. 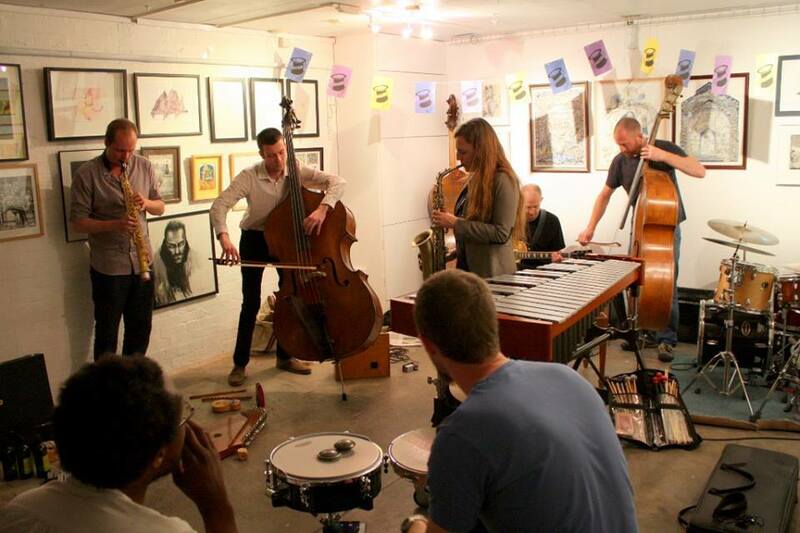 An evening of improvised music featuring musicians from London, Manchester and Macclesfield! A brand-new trio project for 2015, featuring a unique instrumentation that provides a fascinating palette of sounds for improvisation. Two saxophones are joined by no-input mixer…the first appearance of this instrument at LUME so far! No-input mixer involves wiring the outputs of a standard mixing desk into the inputs to create feedback loops that act as signal generators. This can then be manipulated using the mixing desk’s various functions, producing a wide variety of electronic sounds and textures when in skilled hands. Combined with the extended saxophone techniques of Andreae and Ward, the trio creates a unique aesthetic that explores the outer limits of improvisation and noise music. Debut performance of this duo, made up of two musicians often seen in other contexts on the creative music scene. Rory Simmons’ bands Fringe Magnetic, Monocled Man and Eyes Of A Blue Dog have all released critically acclaimed albums, while Ibbetson has appeared on BBC Radio 3’s ‘Jazz on 3’ with his own band The Twelveheads. In addition to drums and trumpet, an emphasis on electronic soundscapes will be prevalent through the use of analogue synths and sound processing. The duo take inspiration from free jazz, improv, rock, electro-acoustic music and electronica, citing bands such as Chicago Underground, Science Friction and Bloodcount as big influences. Join us at Long White Cloud for a foray into improv with electronics…. 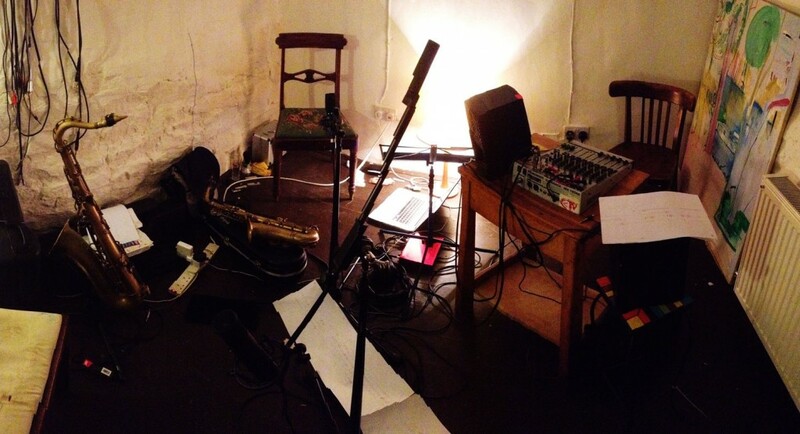 This entry was posted in bass, electronics, fish gets experimental, improv, joy, keyboardfest, laptops, northern friends!, saxes, trumpets on March 20, 2015 by cath. Backyard Chassis is a new trio comprising three extremely high calibre UK improvisers: Corey Mwamba, Johnny Hunter and Adam Fairhall. Their music ranges from busy energetic ‘blowing’ to delicate textures that recall non-Western musics. Timbre and texture are very important to the trio. The keyboards used are mechanical instruments, with the Pianet being prepared using springs, clips and chains to produce a range of percussive sonorities. The toy piano, too, is prepared, using magnets and felt. Corey may bring anything to the gig, from a zither to a wooden flute, and use them all in a wonderfully creative way. The unusual instrumental sonorities provide a rich palette for improvising, and the instruments are really played; there’s no relying on timbre for timbre’s sake! Add to this mix Johnny’s lightning-quick reflexes, sensitivity and propulsive sound, and the result is highly distinctive music, not to be missed. Adam Fairhall – prepared Hohner Pianet T, prepared toy piano and Dulcitone. A new collaboration, with double bass and baritone saxophone. Seth Bennett is a prolific bassist, leading his own trio Nut Club (who you may have heard at LUME last year) as well as playing in Martin Archer’s large ensemble Engine Room Favourites, Laura Cole’s Metamorphic, and the Grew Quartet among many others. Cath Roberts leads ‘dino-jazz, paleo-groove’ septet Quadraceratops and is half of Ripsaw Catfish with Anton Hunter, as well as being your LUME co-host. 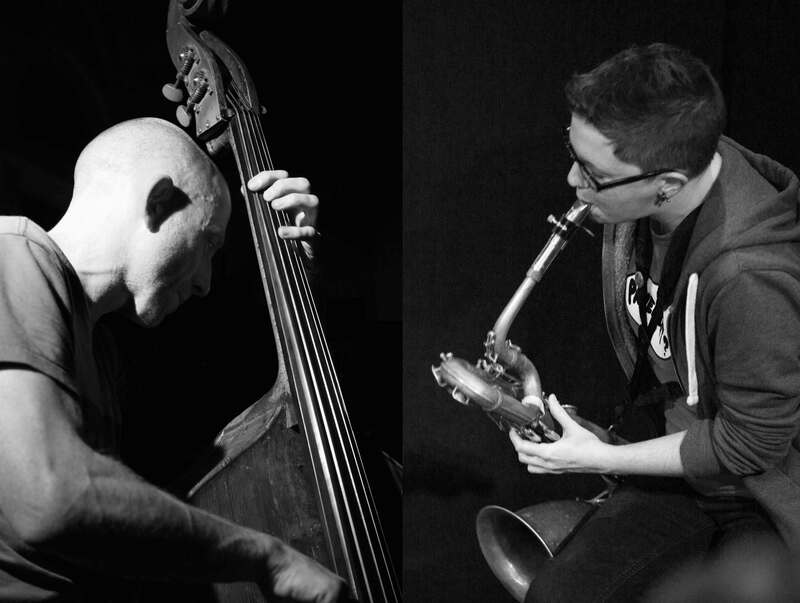 Seth and Cath first played together in Anton Hunter’s Manchester Jazz Festival commission ‘Article XI’ last year, where they were often found playing basslines together (although Seth was actually playing trombone on that gig). It seemed like a good idea to do a duo, so they are. Join us at Long White Cloud: doors 8pm, music at 8.30/8.45pm as usual. This entry was posted in bass, drums, improv, joy, keyboardfest, magic, northern friends!, pandemonium, saxes, toy piano!, vibes on March 2, 2015 by cath.